I had some posts that cover VOIP phone calling service. This time, I like introduce a web service which allows you to use your phone to call domestic and international destination. Poketalk can do this job for you. It is similar with other famous VOIP service Jajah that I wrote before. 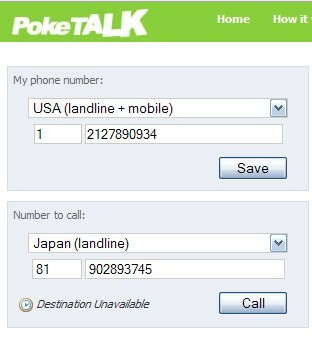 You do not have to use microphone with computer, only you have to do is sign in on Poketalk. Fill your own phone number (landline or cellphone), and a destination phone number. It supports many countries, some countries user can use free calling, like US, Denmark, Canada, France, Germany, Japan, Singapore, UK. After you click "Call" button, it will connect bother phones, after a while your phone will be ringing, just wait a while to dialing to other phone, then talk to each other. Each calling have 10 minutes for free. I tried this service, it works fine.